As students wrap up finals and disperse for the holidays, the Bucky Wagon blog will take a short hiatus. The blog will be back in late January when the vehicle team members return. Until then, don’t hesitate to get in touch with team advisor Glenn Bower at grbower @ facstaff.wisc.edu if you’d like to learn more or get involved with the renovation. Can’t wait until January to check in with the vehicle teams? Then visit the Garage Cam, which offers a live look at the Phil Meyers Automotive Center, which is where all the student vehicle team action takes place. Thanks to all those who joined us last Saturday. Below is a recap of the event from EcoCAR outreach coordinator and life sciences communication student Andrea Parins. The UW Hybrid Vehicle Team displayed three vehicles at Quaker Steak and Lube in Middleton, Wisconsin, Dec. 6 to give community members an up close and personal look at the team’s current projects. A dozen team members stood proudly next to the Bucky Wagon, the EcoCAR and the EV1 vehicle. As the restaurant filled to capacity over the afternoon lunch hours, around 25 patrons spoke with engineering students about the team’s vehicles and took a glimpse under the hood. The Bucky Wagon, which was parked outside the front door for everyone to pass on their way in and out, was a crowd favorite. Badger fans of all ages stopped to admire the iconic vehicle. “The older fans are especially excited for the electric conversion because they remember the awful black smoke seen behind the Bucky Wagon as it drove around the stadium,” says mechanical engineering student Stacey Ley. The Bucky Wagon was also a kid favorite at the event. The team was excited to show off its vehicle projects to interested community members as they watched children climb up and pretend to drive the Bucky Wagon. Inside the restaurant, the team displayed the EV1 vehicle and the EcoCAR, which was sporting a fresh paint job from the Kelly Moss Motorsports shop. Hybrid team leader and electrical and computer engineering student Adam Richards says the entire team is excited about the way the vehicle turned out and was very proud to showcase it along with the Bucky Wagon at Quaker Steak and Lube. This weekend, the Bucky Wagon and vehicle team members are headed to Quaker Steak & Lube in Middleton, Wisconsin. The students will fill up on some chicken wings and talk with the public about their hybrid technology projects, including the Bucky Wagon and the EcoCAR. See below for more info. We hope to see you there! What better way to get ready to watch the Badgers take on Hawaii than chicken wings and the Bucky Wagon? The University of Wisconsin-Madison hybrid vehicle team will be on hand at motorsports-themed Middleton restaurant Quaker Steak & Lube Saturday, Dec. 5 from 11-3 p.m. to showcase two hybrid vehicle projects, the Bucky Wagon and the EcoCAR.. Bring your hybrid questions and interact with faculty and students while surveying the vehicles. 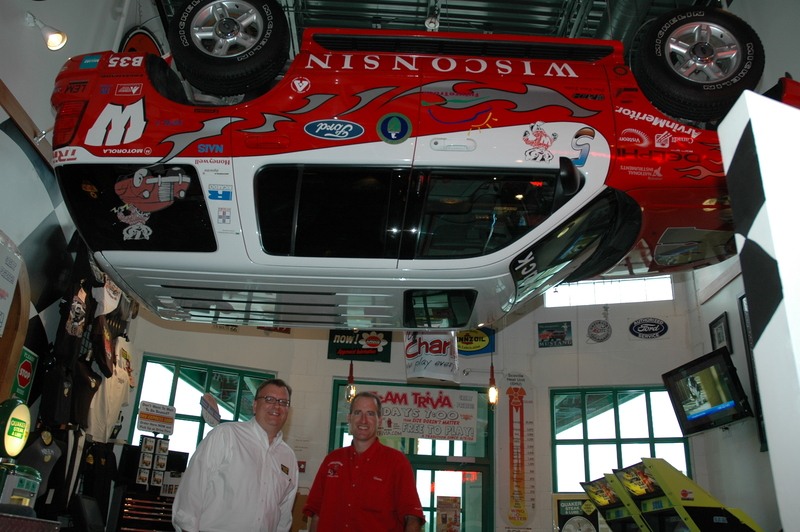 Team advisor Glenn Bower (right) and Quaker Steak & Lube owner Scott Acker stand under the UW Future Truck at the Middleton restaurant. campus and throughout Madison on football Saturdays and for each year’s Homecoming festivities and parade. It is currently in transition to the 21st century as a safe, electric-powered vehicle with power hydraulic brakes and power steering. The EcoCAR project is part of a General Motors and U.S. Department of Energy-sponsored competition, which challenges 17 North American universities to reduce fuel consumption and greenhouse gas emissions. Over the next two years, the team will engineer a hybrid SUV to a plug-in hybrid capable of 20 miles of electric range before the engine is turned-on allowing longer trips on conventional fuels. “This event will be a good opportunity for community members to learn about our vehicle team program and how they can get involved, as well as talk with our students about the importance of hybrid technologies in general,” Bower says. Media and the public are invited to join the UW hybrid team at Quaker Steak and Lube, 2259 Deming Way, Middleton. For more information about the UW-Madison vehicle teams contact team leader Adam Richards, (608) 408-0664, advisor Glenn Bower, (608) 263-7252, or visit http://www.vehicles.wisc.edu/. As high school ended, Richards prepared to come to UW-Madison to pursue engineering. He’d always been a tinkerer himself and enjoyed taking things apart to see how they worked. So he knew engineering was for him–he just didn’t know what specific discipline would be the best fit. While taking a campus tour, he saw the Phil Myers Automotive Center and was intrigued. However, Richards didn’t join the vehicle teams right away. Instead, he joined the Concrete Canoe team. While he enjoyed that experience, his own interests began to draw him toward electrical engineering, which he eventually declared as his major. To align his extracurricular activities with his academics, Richards explored teams with electrical and controls-related activities. The hybrid vehicle team looked like just the opportunity. “I just emailed the team leaders and eventually started coming to meetings,” he says. 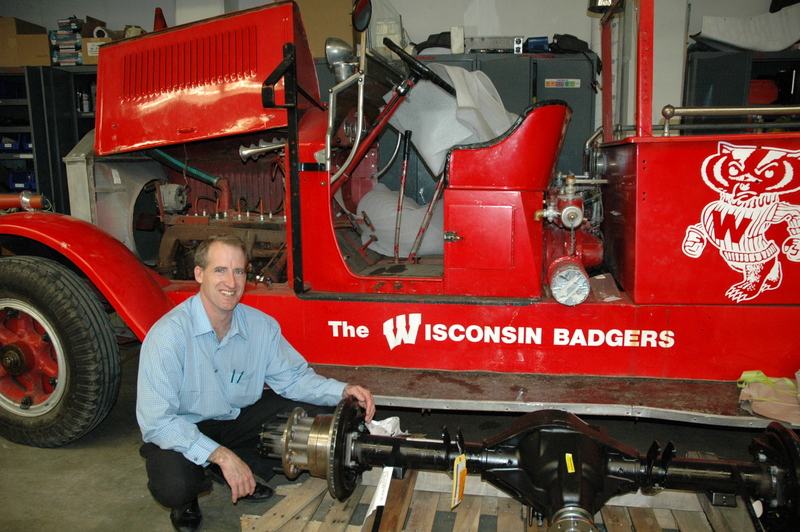 By the 2008-2009 academic year, Richards was the controls leader for the UW-Madison EcoCAR project, which was in its first year. That year the Hybrid Team focused heavily on its electrical and controls projects, and Richards was deeply involved with the team. Richards additionally oversees the team’s work to fit and install a new powertrain into the team’s EV1 vehicle, as well as the Hybrid Team’s work for the Bucky Wagon renovation. Jackson, Michigan, is a city of around 36,000 people located in the center of southern Michigan. East of Detroit by 94 miles, Jackson is home to one of very few fire apparatus restorationists. In late October, vehicle team advisor and Faculty Associate Glenn Bower stopped on the way to the Motor City Badgers’ Road Trip Rally to visit Kenneth Soderbeck, a retired firefighter who is now one of the nation’s only experts on LaFrance fire trucks. Soderbeck runs Hand in Hand Restoration, which specializes in horse-drawn and early-motor fire equipment. Bower needed Soderbeck’s expertise to learn specific information about the Bucky Wagon’s model and original parts. It was also a chance for Bower to talk to Soderbeck about the students’ efforts to turn the Bucky Wagon into an electric vehicle. 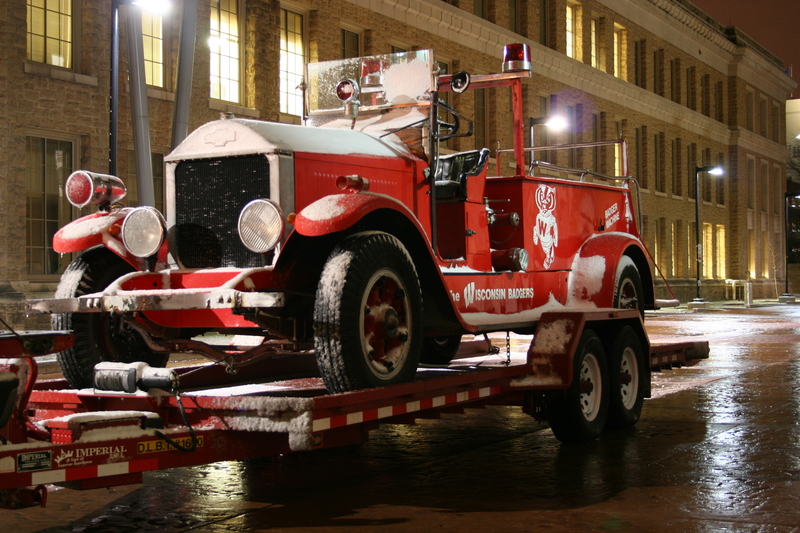 Not all antique fire engine enthusiasts would welcome the substantial changes the UW-Madison renovation will entail, but Soderbeck is far from upset. Soderbeck, who maintains a database of antique fire apparatuses, was able to tell Bower that the Bucky Wagon, which is a model 391 LaFrance pumper truck, was one of only 55 produced in 1932. The 391s were cheaper than other LaFrance vehicles because they were produced with parts from a variety of companies, rather than produced with wholly custom LaFrance components. The 391s were a result of a long line of improvements throughout the 1920s and 1930s, so thousands of this general type of pumper were produced. Now, Soderbeck estimates a half dozen remain, making the Bucky Wagon project all the more special. The students plan to preserve as much of the wagon’s exterior as possible, including the original hubcaps, and the visit with Soderbeck gave Bower a clear picture of what the Bucky Wagon originally looked like. The team is lucky Soderbeck is just a state away; he is one of only three or four fire apparatus restorers in the United States. So what does he find appealing about antique fire engines? Hauling five vehicles and eight people more than 400 miles is no simple feat, but when it comes to all things automotive, UW-Madison faculty and students will do whatever it takes. Last Saturday, Oct. 24, Glenn Bower and a group of vehicle team members headed to Detroit, Michigan, for the first-ever Motor City Badgers’ Road Trip Rally. The Detroit chapter of the Wisconsin Alumni Association organized and hosted the event and launched the Undergraduate Student Automotive Excellence Fund campaign. The team is hoping to raise $10 million to take the teams to the next level and ensure UW-Madison remains a source of innovative, well-trained engineers to the automotive industry for generations to come. Students and alumni drove the Formula SAE car around cones in a Ford parking lot as part of the Motor City Road Trip Rally. This relationship between UW-Madison and Southeastern Michigan is why the Motor City Badgers decided to host the Road Trip Rally, says chapter president Mark Polster, a sustainability, environment and safety engineer at Ford. “The Road Trip Rally raised awareness of the vehicle programs in the Motor City among alumni, original equipment manufactures, suppliers, aftermarket providers and racing companies, and in turn promoted the automotive industry and Southeastern Michigan on the UW-Madison campus,” Polster says. The event offered attendees the chance to test drive the UW-Madison Baja vehicle, Formula hybrid car, electric snowmobile and electric test car around dozens of cones arranged in the Ford plant parking lot. After the Ride ‘n Drive, a group of almost 70 toured the Roush Automotive Collection in Livonia, Michigan, and students and alumni enjoyed viewing the extensive collection of classic cars, sports cars and racing vehicles, including the 2003 NASCAR Winston Cup-winning stock car driven by Wisconsin native Matt Kenseth. Several speakers addressed the crowd, including mechanical engineering student and Formula team member Luca Mantovano, who talked about the importance of his experiences with the vehicle teams. Check out photos from the event at the Bucky Wagon Facebook page or at the Road Trip Rally Picasa album. For the first time in decades, the Bucky Wagon did not navigate the streets of Madison under its own power during the UW-Madison Homecoming Parade. Instead, the vehicle was relegated to a flatbed truck for the event, held the night of Friday, Oct. 16. Also differently than in previous years, Bucky Badger and members of the Spirit Squad didn’t ride in the vehicle. 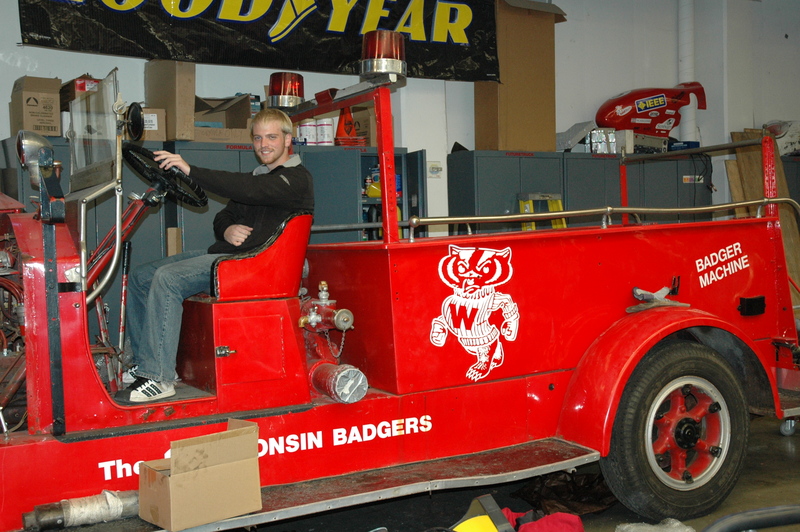 Instead, almost 15 members of the UW-Madison vehicle teams were on board. The Bucky Wagon wasn’t the only vehicle project in the parade. In fact, all six of the vehicle teams were represented, and Adam Richards, the UW Hybrid Team leader, says it was a night of unity for the teams. “It was cool to meet everybody from the different teams, since usually we all have our own corner of the shop,” he says. More than 50 vehicle team members were at the parade either walking beside or riding on one of the vehicles. The parade was also a chance for team members to connect with alumni, and Richards says the Bucky Wagon was one of the first vehicles people wanted to pose with for pictures. The Bucky Wagon was the focus of many more flashbulbs the next morning at the Homecoming Badger Bash tailgate. This is the first season the Wisconsin Union Badger Bashes (which are held before every home football game and offer attendees food, drinks and the chance to see the UW Marching Band) have been held on Engineering Mall, and it’s fitting since the Bucky Wagon is currently housed at the automotive shop in the Engineering Centers Building. “I enjoyed talking to alumni about the Bucky Wagon and how much they miss seeing it at football games and other events,” Strutz says. One alumnus reminisced with Strutz about driving the vehicle and expressed hope that the students will preserve as much of the original vehicle as possible. The Bucky Wagon rode on a flatbed during the 2009 Homecoming Parade. The Badger Bash was also an opportunity for Bower and the students to introduce alumni to the Undergraduate Automotive Excellence Fund, which is an endowment to keep the six UW-Madison vehicle teams running. Team members hope to raise $10 million over the next three years. For more information about the fund and how to get involved, check out the vehicle team donate page. Now that the Homecoming festivities are over, the vehicle team members will get to work on the renovation, and by next year’s parade, the Bucky Wagon will once again drive the streets.